Though the Indian Equity Markets witnessed volatility during the day, it ended the day with some modest gains as the benchmark Index NIFTY50 gained 55.90 points or 0.52%. It was second day in a row that the Markets continued to resist to the 10820-10850 zones. In the Tuesday’s trade, after resisting to this zone for the entire day, the NIFTY ended very near to the critical 10850-mark. Wednesday’s opening will be crucial for the Markets. After a brief consolidation in the 10820-10850 zones, if the NIFTY has to resume any meaningful up move, it will have to move past the 10850-mark and stay above that. With opening levels crucial, longer the Markets remain below this critical mark, higher will be the chances of it remaining into consolidation for some more time. Wednesday will see the levels of 10850 and 10930 acting as important resistance levels for the Markets. Supports come in at 10780 and 10735 zones. 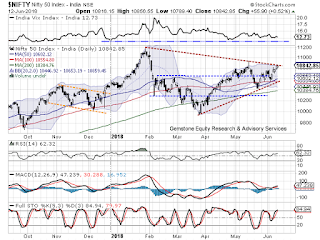 The Relative Strength Index – RSI on the Daily Chart is 62.3188 and it has marked a fresh 14-period high which is bullish. RSI does not show any divergence against the price but it is seen breaking out of a pattern resistance. The Daily MACD stays bullish while trading above its signal line. No significant formations were observed on Candles. Going by the pattern analysis, NIFTY still continues to the falling trend line that joins 11179-mark to its subsequent lower tops. NIFTY will have to move past 10850 and remain above that level to attempt to resume any meaningful up move. Overall, though NIFTY still continues to resist with the 10820-10850 zones, it has shown some inclination to move past it. F&O data suggest short covering from levels and also some fresh longs were seen being added. 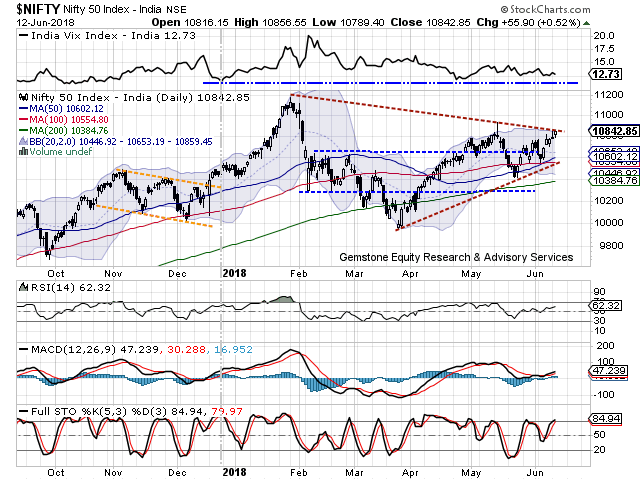 Though it remains slightly overstretched on the Daily Charts, NIFTY has demonstrated underlying strength and shows inclination to breakout from the current resistance area. We recommend to continue to remain highly stock specific while making purchases and extremely vigilant at higher levels unless a meaningful breakout is achieved. Long positions were seen being added in JSW STEEL, ICICI BANK, STATE BANK, HDFC, TCS, L&TFH, KPIT, TV18 BROADCAST, EXIDE, TATA ELXSI, BHEL, NATIONAL ALUMINUM and NCC.